It means I don't only write about places - I have made this website to help you with planning your own great adventure trip. Driving with views - Old Coach Road. It also means I don't only cover the obvious tourism attractions, but also the locals' spots that you don't hear about elsewhere. 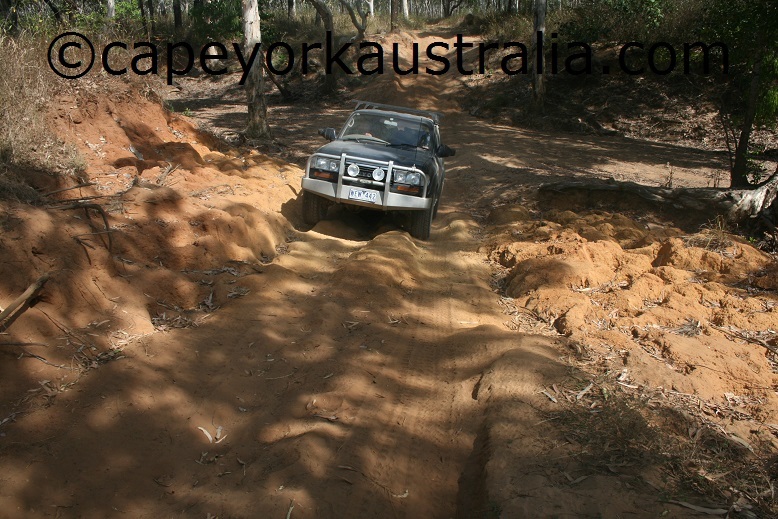 I cover the most popular activities such as fishing, bush camping, driving the Old Telegraph Track .. and not only that, I tell you about the best spots and tracks where to fish, camp and four wheel drive. Fishing in Mapoon, north of Weipa. I also tell you about the history, geology and wildlife of the region, and where you can see the unique plants, birds and animals that the peninsula only shares with Papua New Guinea - and not the rest of Australia. A deadly saltwater crocodile, near Crab Island. You will also find the practical information about planning your trip, what things are good to know and what can be dangerous. It is like going for a trip with a local. Ready for a quick look? Cairns is south of the peninsula, but because any traveller to the peninsula is most likely to spend some time in Cairns, I have covered the city. The beautiful cliff face nicknamed "Queensland's Uluru". 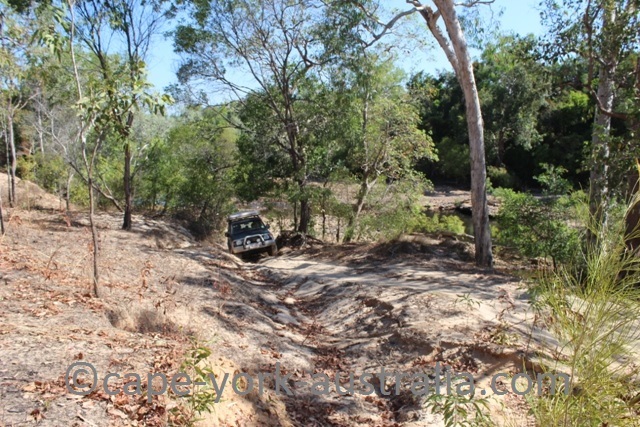 * Inland from Cairns are Kuranda, Mareeba, Dimbulah, the historical Hodgkinson River Goldfields, Almaden, Chillagoe, and the Burke Developmental Road that takes you to Karumba and Normanton, Pormpuraaw and Kowanyama, in another beautiful area - the Gulf Savannah. 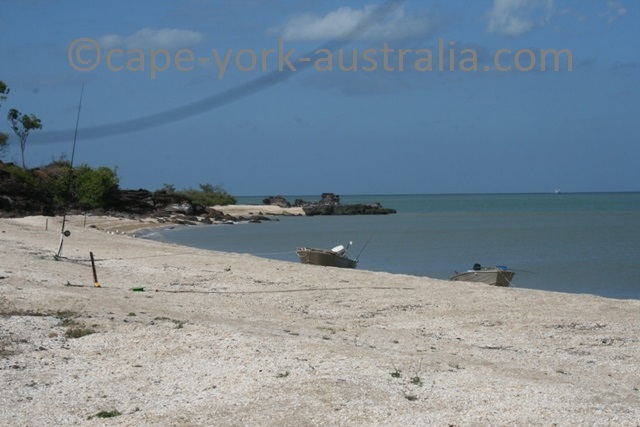 Remote communities on Gulf Savannah: Pormpuraaw. * Along the coastal way north of Cairns is Cook Highway with Cairns northern beaches, Port Douglas, Mossman, Daintree and Cape Tribulation, and after that the unsealed Bloomfield Road to Cooktown, and further north Lakefield, Starcke, Cape Melville and Bathurst Head. 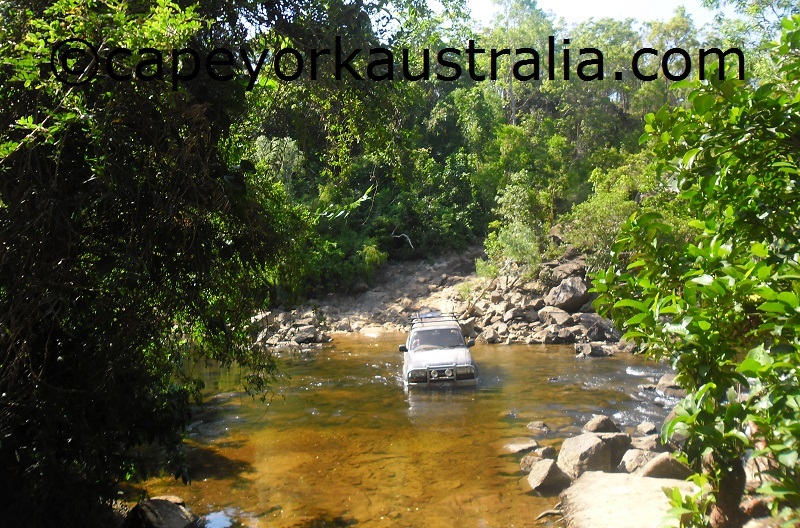 Driving the Starcke Wakooka Track to Cape Melville. * And along the inland way north - Mulligan Highway and the Peninsula Developmental Road aka PDR - are the historical mining towns Mt Molloy and Mt Carbine, the famous Palmer River Goldfields, and then Lakeland, Laura and Musgrave. 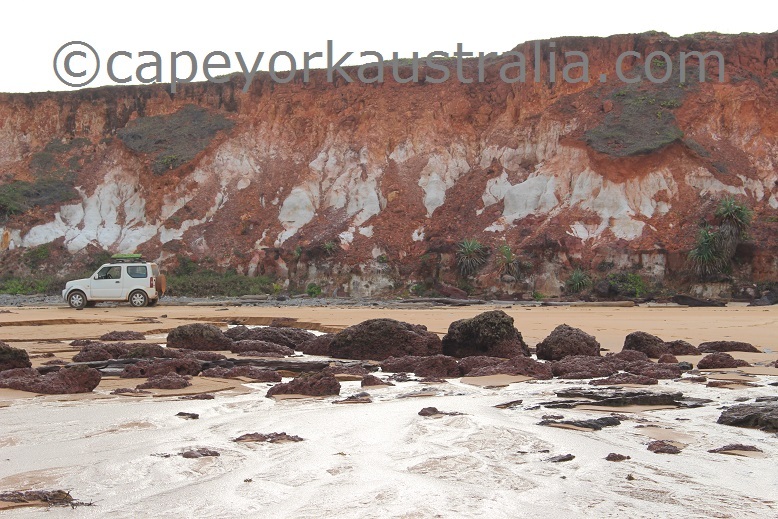 * Further north, on the central peninsula, are Princess Charlotte Bay, Coen, Oyala Thumotang National Park (former Mungkan Kaanju), Archer River, Iron Range National Park and Weipa. Northernmost point of mainland Australia (behind are just two small islands). 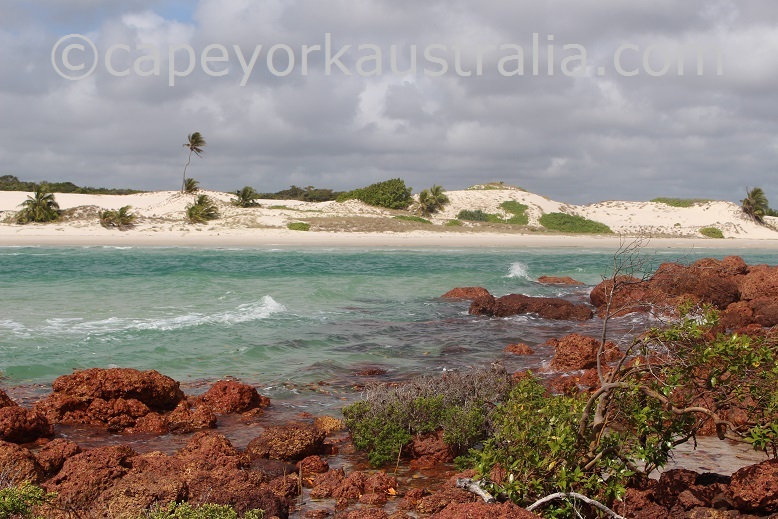 * And furthest north are the Northern Peninsula Area and Tip of Cape York - the northernmost point of mainland Australia. 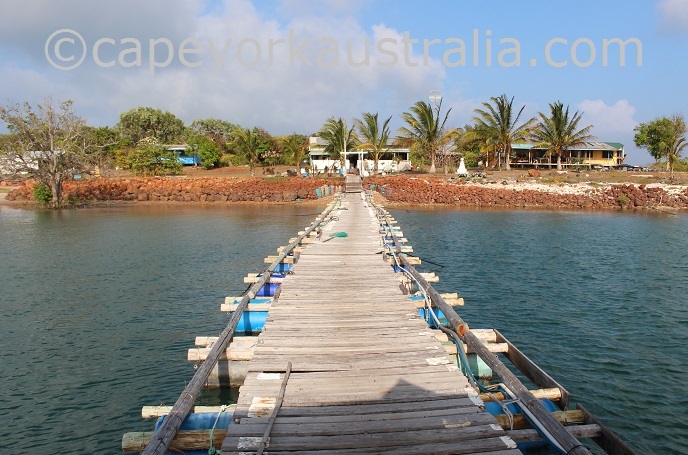 * Off the coast are the beautiful Torres Strait Islands, amongst some very blue waters on a sunny day. But these are only some of the most obvious places. 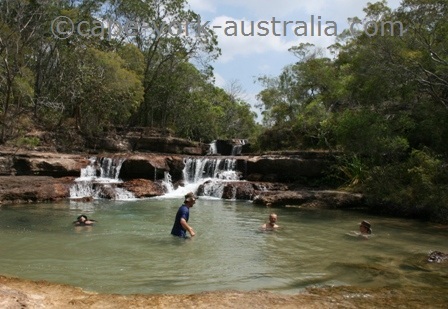 Fruit Bat Falls - a great swimming hole (not a secret). And here are some of the best gems reminding you that the Old Telegraph Track is far from the only fun on the peninsula :-) (and you find them all on the Site Map of this website). 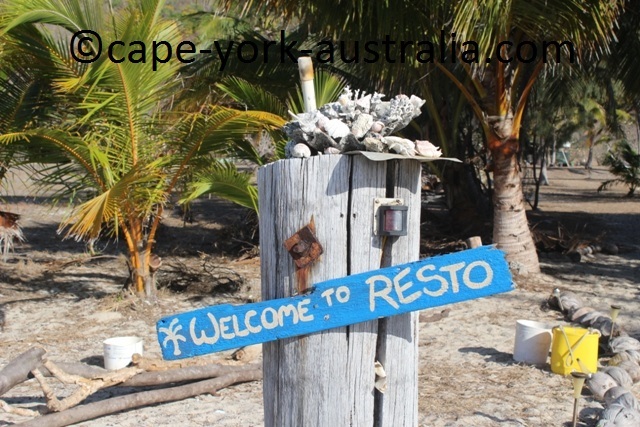 I promise to use it only to send you Cape York News.